AP SA1 Time Table 2018 from Nov 12th as per Rc No 3 For 1st to 10th Classes : Download AP Schools SA 2 Time Table 2018-19 in pdf AP SA Time Table 2018 | AP Schools SA1 Schedule 2018 Download AP schools academic calendar 2018-19 for Primary Schools. AP SA1 Exams Time Table 2018 – AP Summative I Schedule Exam Dates AP SA 2 (Andhra Pradesh Summative Assessment II) Exams Time Table 2018-19 | Exam Dates (22-11-2018 to 29-11-2018). AP SA1 Time Table 2018 from November 12th as per Rc. No 3/B/C&T/SCERT/2016 Dated: 22-10-2018. Summative Assessment 1 revised schedule released SCERT director. AP Amaravati implementation of Examination Reforms Summative Assessment Time Table for the Primary level is from Nov 22nd – 27th, 2018. High School Level SA-l Examinations is scheduled from Nov 22nd - 29th-Orders Issued Reg. All the Regional Joint Directors of School Education and District Educational Officers in the State are informed that, it is decided to conduct Common Summative Assessment - I from 12-11-2018 to 29-11-2018 for High Schools, and for Primary schools is from 22-11-2018 to 27-11-2018. Schedule is to be strictly adhered to as the assessment is common across the State. In this regard all the RJDSEs, District Educational Officers in the State are requested to communicate Examination Schedule to all Schools under all Managements in their respective districts. Class X Question Papers will be supplied by the Director, Government Examinations. In this connection all the District Educational Officers are informed to instruct their ACs and Secretary, DCEBs to distribute Question Papers duly following strict confidentiality. And also utilize the services of Mandal level 3 member committee to monitor SA - I examinations in their respective Mandals. 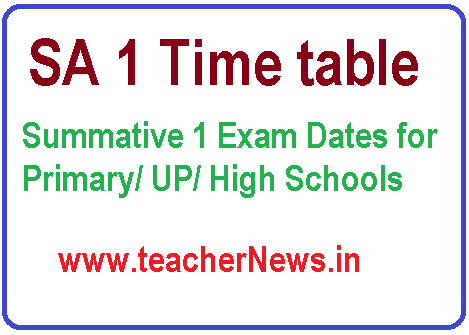 AP SA1 Examinations 2018 Time Table | from 22nd Nov 2018, AP SA Time Table 2018, AP Schools SA1 Schedule 2018, AP SA1 Exams Time Table 2018 - AP Summative I Schedule download.